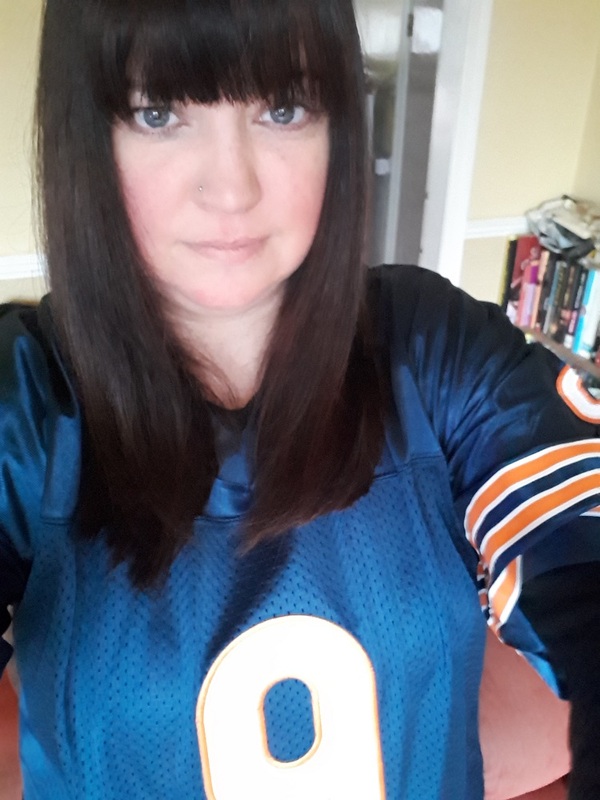 As part of our series in celebrating female NFL fans across the UK, I’d like to introduce you to Kath Roden, a Chicago Bears fan. Kath shares with us how she got in to the NFL, how she made the choice of her team as well as more about her overall experience as a fan. The year was 1980 something…well ’85 to be precise. My brother and his mate were massively in to this new sport called ‘American Football’, Channel 4 had just started showing it and from the little I had seen it was all razzamatazz, Cheerleaders, shoulder pads (well it was the ‘80s) and some bloke called The Fridge. His mate was a Dolphin’s fan but my Brother backed (quite wisely as it turned out) The Bears and because I was an annoying little sister and wanted to do everything he did I too was a Bears fan. The seed had been sown. Fast forward 20 something years and him indoors was also massively in to all things Gridiron. He introduced me not only to the delights of the NFL but also College football. After years of moaning about it always being on our telly, I decided that if you can’t beat ‘em, join ‘em and once I learned the basics and understood what was going on I was hooked. Our first foray into live games came in 2001 when we went to Toronto and saw the Phantom’s take on the Carolina Cobras in Arena Football. In 2003 again in Toronto we saw the Argo’s take on Hamilton Tigercats in the CFL. In 2004 we went north of the border to watch the Scottish Claymores play their final ever game at Hampden Park against Cologne Centurions. In 2014 we saw Penn State take on UCF Knights at Croake Park Dublin and in 2017 we finally got to London and saw the Minnesota Vikings beat the Cleveland Browns at Twickers. The nearest I have been to see anything in America was in 2010 when myself and a friend went to Dallas. 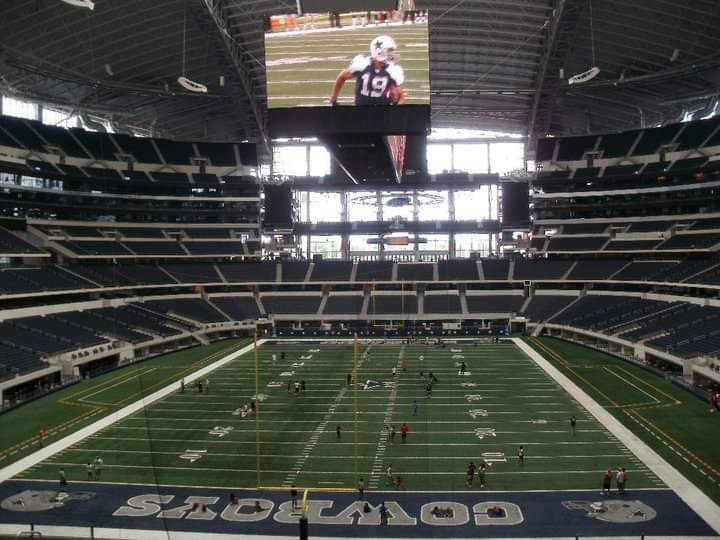 Whilst there we went to the 6 month old AT&T stadium in Arlington and did the tour. This was a fascinating behind the scenes look at an NFL colossus. 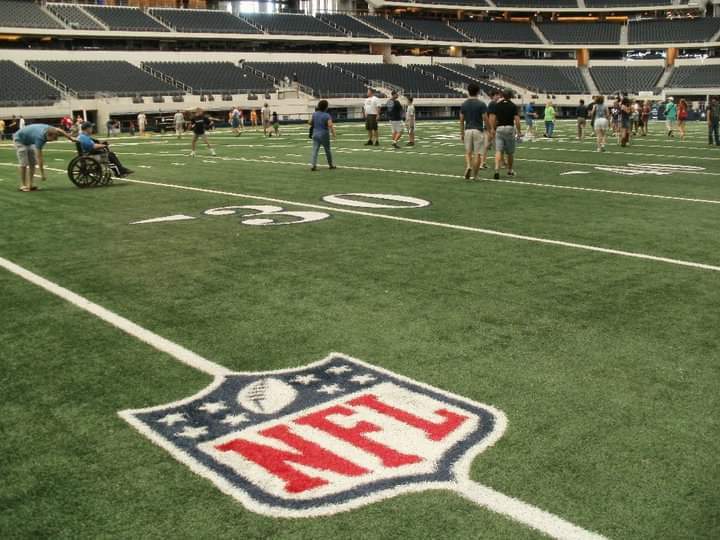 Even though I’m not a Cowboys fan, to go into the dressing rooms and onto the field was still exciting. I even got to sit in Jerry’s seat and very comfy it was too! That only leaves the bucket list of seeing the Bears at Soldier field, Notre Dame in South Bend, a College Bowl game and the Holy Grail of the Superbowl – a girl can dream! From its humble beginnings in the UK back in ’85 I love seeing how much it has grown today with an ever increasing fan base and I like that people from all walks of life have embraced the game. One thing I’ve noticed, when I’ve been to fan meetups, compared to other sports is that no matter your gender, age, race or sexuality if you are conversing with other fans none of that matters and your opinion is listened to and not mocked no matter what team you support. The NFL itself is not perfect and it needs to up its game (pardon the pun) in terms of its representation of Women in the sport. We’ve recently had our first female official which is great, but we need more coaches at the top level and to put money into the female game away from the highly embarrassing Lingerie League, like FIFA have done in Women’s Soccer. Grassroots level on both sides of the pond and for both sexes would be an ideal place to start and get the seed sown in the next generation. Maybe then we can talk about a UK Franchise.